Aside from the eagles and durian, what else can one see in Davao? What can tourists do in a place dubbed one of the safest cities in the world? 1. Own an island for a day or more. Do you want to go to the beach but hate crowded places? Are you looking for a perfect getaway with your loved ones and friends? Located in Samal, Davao, the Island Buenavista Davao will make the entire island exclusive for you for a day or more, depending on your budget. For Php105,000 per night, the whole island will be exclusive for two to 10 persons. Rate per night in excess of 10 persons is Php5,200 per person. The island will only allow a maximum of 35 persons. Celebrities such as Piolo Pascual and his family and Charo Santos-Concio have been there. The rates include the exclusive use of the four-hectare island (during high tide; eight hectares during low tide) and its facilities and amenities; accommodations at its unique villas and suites; round trip boat transfers to and from the island; three buffet meals and two snacks; plus complimentary use of its sports and leisure facilities for snorkeling, kayaking, beach volleyball, and swimming. If you want a romantic date, you could actually request the staff to set up dinner/breakfast by the beach. For those with tighter budget, don’t worry. The Island Buenavista Davao offers Day Tour Package for a fixed rate of Php38,000 for 10 people. Pictorial package is also available for only Php10,000. Experience white sand beach and Davao Gulf’s crystal-clear water. For more details and for inquiries, one may contact Buenavista Island Resort Inc. at (+6382) 2992 to 94 (local 116). 2. Take adventures, enjoy the nature. At Eden Nature Park, you will be surrounded with so many greens and flowers during a tour, and then you can opt for some adventures, too. 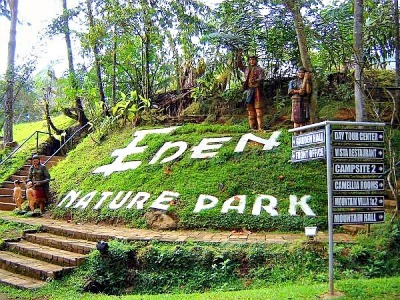 A mountain resort that is 3000 feet above sea level, Eden Nature Park offers not just a peaceful surrounding, but a cool breeze as it is surrounded with thousands of pine trees. Aside from horseback riding, there are other activities for the adventurous ones. Test your bravery with Skycycle, wherein you’ll literally ride a bicycle on a cable wire. It looks scary when you’ll look at the cable up close, but that feeling will be gone once you pedal the bike. Enjoy the ride on top of so many trees! If you don’t have fear of heights, you can choose to do the zipline once you’re done with Skycycle. Don’t worry. Everything’s safe there. For inquiries and reservations, one may contact the Eden Nature Park Sales Office at numbers (+6382) 2991020, 2960791. 3. Visit the Public Safety and Security Command Center (PSSCC). This might sound weird but by doing so, you will have a glimpse as to why Davao City became one of the safest cities in the world. Here, you will appreciate how the local government of Davao City takes care of its people. The PSSCC was created to provide protection, security, safety and risk management to the Davaoenos. It operates through coordinative approach to address concerns on crime, terrorism, traffic, health, emergency services and disaster risk reduction through using information, technology and intelligent solutions. The Davao City 911, for instance, takes calls 24/7. Just dial 911 when you’re in Davao and you can be assured there’s someone who will help you in case of emergency. As you tour the PSSCC, you will also witness how they monitor so many CCTV cameras installed around the city. They don’t just monitor the traffic, they also monitor crime. Beware also not to smoke in public areas. Remember, there are many CCTV cameras out there. Pub Crawl is what we call bar hopping in Manila. This is not to entice you drink so many alcoholic beverages. The Department of Tourism (DOT) Region XI wants to tell people that there is night life in Davao. This is why, for the second year of DOT’s Visit Davao Fun Sale (VDFS) campaign, the agency has included “Pub Crawl” in its offerings. For a discounted rate, guests will be toured to several bars located blocks away from each other. You’ll be surprised to see that most pubs in Davao are quiet, and the people there are behaved, making you feel that you are in a coffee shop. Some bars have live bands, too. 5. Catch the Kalumon Performing Arts. Kalumon Performing Arts is a very talented group. We’ve witnessed them perform various song and cultural dance numbers for about an hour, and they never seemed to get tired. This group create performance pieces rooted in the culture of indigenous Filipinos. Their performance will make you appreciate the beauty, talents, and culture of Davaoenos. Kalumon Performing Arts was already featured at the 26th Korea World Trade Fair held in Seoul, South Korea in 2013; and also appeared on ABS-CBN’s noontime show, “It’s Showtime!” You can catch them perform at around 8 p.m. at the Matina Town Square (MTS), the entertainment hub of Davao City. MTS is a popular venue for live band performances of homegrown musical artists, especially during weekends. It is an open complex for several shops, restaurants, bars and coffee shops. There is so much to enjoy and so many to discover in Davao City. The DOT, in fact, plans to introduce Davao as an alternative destination to the international tourist market.